Corrugated Machinery manufacturers– Corrugated Machinery manufacturers manufacturer in Mumbai and Corrugated Machinery manufacturers supplier in Mumbai, India. 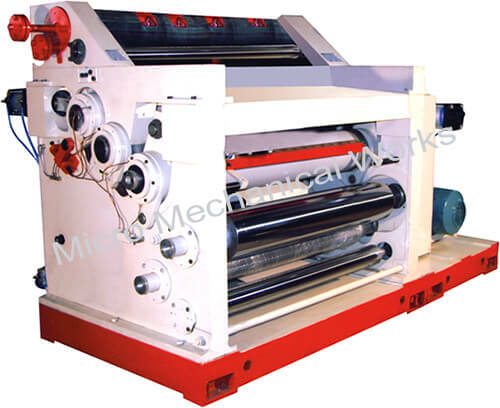 Corrugated Machinery Manufacturers - We are Micro corrugated board plant Manufacturer in Mumbai. Design speed : 60 mt/min. Adjustment of upper corrugating roller and pressure roller is controlled manually. Glue unit moves on lever systems fitted with gear motor to keep the glue applicator roller rotating while the gum unit is disengaged from the flute roller. Pre-conditioner for flute media paper (optional). Drive through transmission gear box. If Steam Heated Boiler Cap kg/hr.